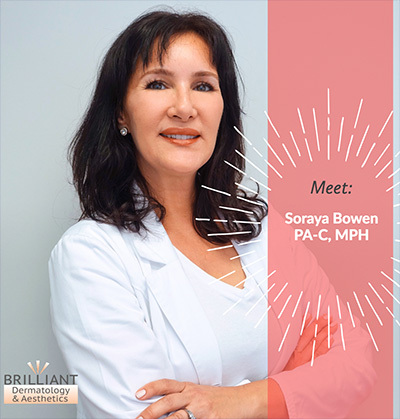 Soraya Breda Bowen is a Board Certified Physician Assistant, practicing dermatology since 2002. Initially from The Catskills, New York, Soraya moved to Boca Raton as a teenager and graduated with honors from Spanish River High School. She completed her undergraduate education at Florida Atlantic University graduating with a Bachelor’s of Science in Medical Technology. She worked as a Medical Technologist and Microbiologist at Delray Medical Center and Cleveland Clinic Hospital for many years before returning to school to pursue her passion for dermatology. Soraya graduated from Nova Southeastern Univeristy with a Bachelor’s of Science in Physician Assistant and a Master’s degree in Public Health. Prior to joining Dr. Norton, she worked in a large dermatology practice for over 15 years. Soraya provides a wide range of medical and cosmetic dermatology services to patients of all ages. Her excellent diagnostic skills and her passion for educating patients on their skin conditions have made her a well-loved provider. She is a member of the American Academy of Physician Assistants, the Florida Society of Dermatology of Physician Assistants, and the Society of Dermatology Physician Assistants. Outside of work, Soraya is a school science fair judge and a middle school basketball coach for her three daughters. Soraya is fluent in English, Portuguese, and Spanish.